Avocado Tomato Salsa delicious alone, with chips, or as topping for beans or lentils. Great for Taco Tuesday. Hi. It’s Lois in the kitchen at Recipe Idea Shop, talking about putting avocados and tomatoes together to make Avocado Tomato Salsa, my version of Taco Tuesday or Cinco de Mayo food. 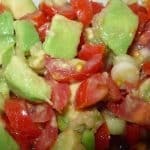 I love tomatoes and avocados together, so what’s not to love with this Avocado Tomato Salsa? This is a quick-to-make salsa that is delicious on Lentil Soup, chips or just about any kind of black bean dish. 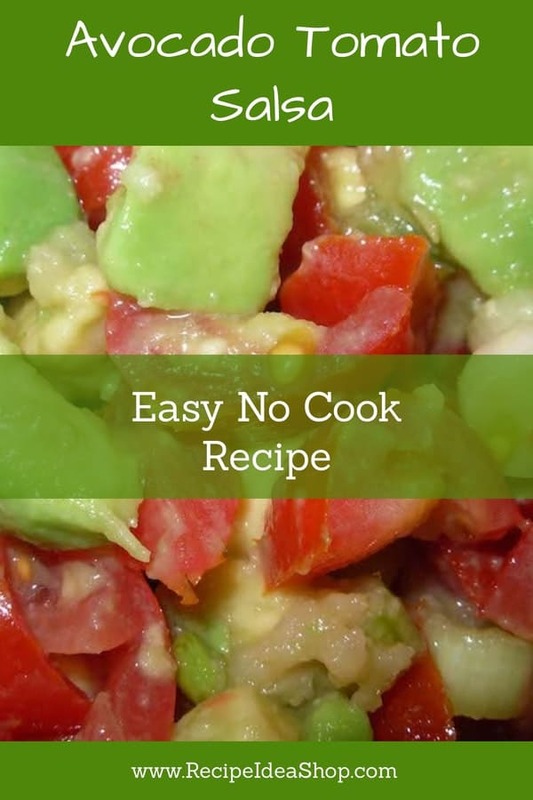 The avocados add a creaminess and the other ingredients add flavor and a little bite to the dish. I Wish It Was Summer! Cinco de Mayo always signals the start of “summer” to me. What’s your favorite salsa? And what does summer mean to you? Sunshine. Flowers. Sitting by the lake. Hiking in the mountains. It’s a time to be outdoors. But don’t wait until summer to get outside…or to eat this Avocado Tomato Salsa. I love this salsa all year round. It is fabulous as a garnish for Lentil Soup, Stuffed Eggplant or Black Beans Tortilla Chips Casserole. APOLLO WALKER Picnic Backpack for 4 with Cooler Compartment, Coffee Holder. Buy it on Amazon. Mix all the ingredients except the avocado and mint. Add the avocado and mint and stir gently. 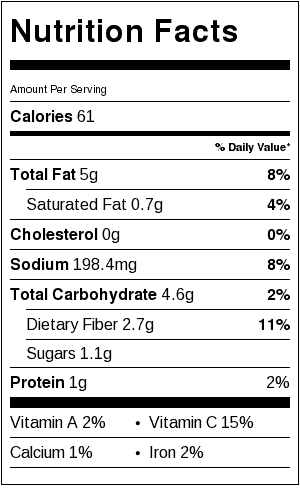 Avocado and Tomato Salsa Label. Each serving is about 1/2 cup. This looks fabulous — definitely will try it. And I love the fact that it doesn’t contain cilantro, which I really don’t like. I always substitute parsley when a recipe calls for cilantro. Thanks, Elizabeth. I hope you love it.